Buy CavinKare Meera Shikakai and Badam Shampoo make Cleaning and anti-dandruff properties, hair soft and shiny. New Meera Shampoo combines the natural goodness of shikakai and badam. Shikakai is a natural cleanser which keeps your hair healthy and badam is a natural protein which makes your hair strong. 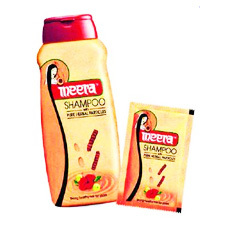 Enjoy strong healthy hair for years with Meera Shampoo.